You’re Never Too Young to Fight Censorship! 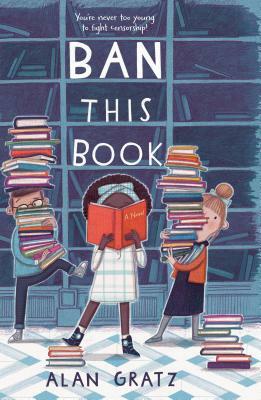 Ban This Book is a stirring defense against censorship that’s perfect for middle grade readers. Let kids know that they can make a difference in their schools, communities, and lives! ALAN GRATZ was born in Knoxville, Tennessee. After graduating from the University of Tennessee, he began a succession of jobs—newsletter writer, high school teacher, university lecturer, bookseller, radio commercial writer, advertising copy writer, middle school teacher, library shelver—all the while working on various writing projects. In 2006, he published his first novel, Samurai Shortstop, an ALA 2007 Top Ten Book for Young Adults. Alan’s award-winning books include The Brooklyn Nine, Fantasy Baseball, Starfleet Academy: The Assassination Game, Prisoner B-3087, and The League of Seven, the first in a series of alternate history middle grade fantasy novels. When he’s not writing, he’s usually reading other people’s books or creating an awesome new costume for science fiction/fantasy conventions. He lives with his family in North Carolina.